St Ciarán was not the only saint to have a magical cow, his neighbour St Manchan of Lemanaghan also had a cow with the ability to produce an endless supply of milk. Lemanaghan was founded in the seventh century, when King Diarmaid son of Aedh Sláine, granted the land of the territory of Tuaim-nEirc (Doimerc) to Clonmacnoise following his victory at the battle against Guaire King of Connaught in 645/646. Manchan a monk of Clonmacnoise, founded a sister monastery within this newly acquired territory at Lemanaghan. The place-name Lemanaghan “Liath-Manchain” in Irish means the grey place of Manchan”. Manchan died in 664/665 having caught the yellow plague that raged through the country. Most of what we know about the saint comes from local folklore. According to folk tradition St Manchan had a cow that had the ability to supplied milk to all the people of Lemanaghan. The cows amazing milk producing qualities inspired envy in others and according to a local folk tale one day when the cow was grazing outside of the monastery the people of Kilnamaghan came and stole her (The Schools Manuscripts 1939 Vol 810, 104). They brought the cow backwards and at every little well that was on the way the cow drank. As she came up from the well she even left the track of her feet in the stone. The well and the tracks of her feet in the stone are yet to be seen. When the Saint came back he missed the cow and set out in search for her. View of St Manchan’s road at Lemanaghan. 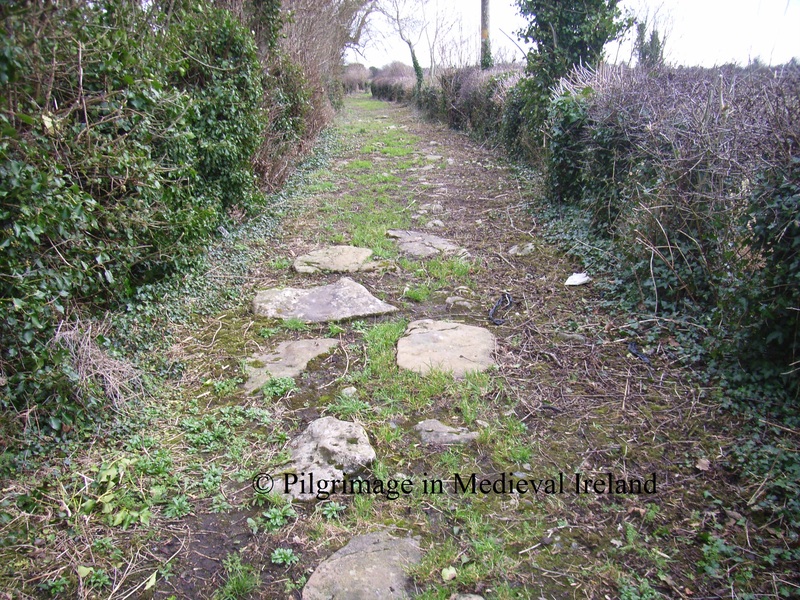 The cow was said to have left marks of her feet on this small stone causeway beside the main monastic site at Lemanaghan. When Manchan realized his cow was missing he was very upset but luckily was able to traced the cows movements by following the tracks made by her hooves and tail on stones along the route of her journey. Manchan followed the signs left by the cows until he reached Kilnamaghan. The saint to his horror found his beloved cow boiling in a large pot inside a hut. The hide of the cow was left behind the door. The saint hit the hide a kick and up jumped the cow alive and well. It was said she was every bit as good as she had been before but for the loss of a bone which caused her to be a bit lame (The Schools Manuscripts 1939 Vol 810, 104). 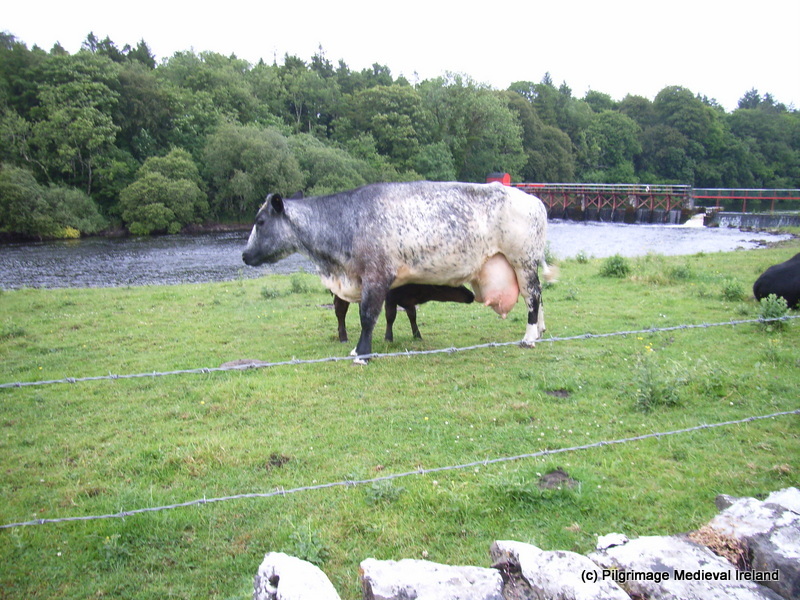 This tale has many similarities to contemporary folk tales told about St Ciarán’s cow. The kidnapping and returning from the dead didn’t seem to cause too much distress to the cow and when she came back to Lemanaghan she supplied milk to the people just as good as before. It is saint that ever since that time the people of Lemanaghan have never sold milk and also they keep St Manchan’s day as a holiday of obligation (The Schools Manuscripts 1939 Vol 810, 104). The tradition of not selling milk survived down to modern times and in 1999 an Irish Times article reported on the tradition among farmers in Lemanaghan to not sell any milk. The tradition is observed to this day by the locals who believe that if they sell their milk they show disrespect to their local patron saint. They will give any surplus milk away but will not accept any payment for it. They make their living by rearing suckler cows, beef cattle and sheep. one man who moved into the area refused to believe the tradition and in the 1940s set up a dairy herd. Eleven of his cows died overnight, and the calves were born with heads like sheep. The man gave up dairying. St Manchan and his cow are still fondly remembered in the area and have a meaning for the local community. This is clearly seen at the local parish church at Boher which boasts a magnificent Harry Clarke window which depicts the saint and his cow. 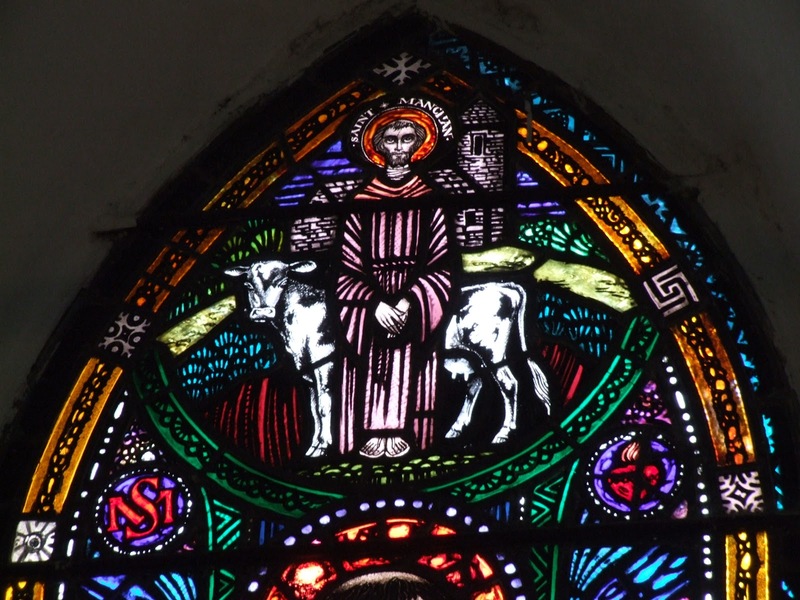 This entry was posted in Folk traditions, Saints and Animals, Uncategorized and tagged Lemanaghan, Offaly folklore, St Manchan and his Cow, St Manchan's Cow. Thanks so much David and a very Happy Christmas to you too.